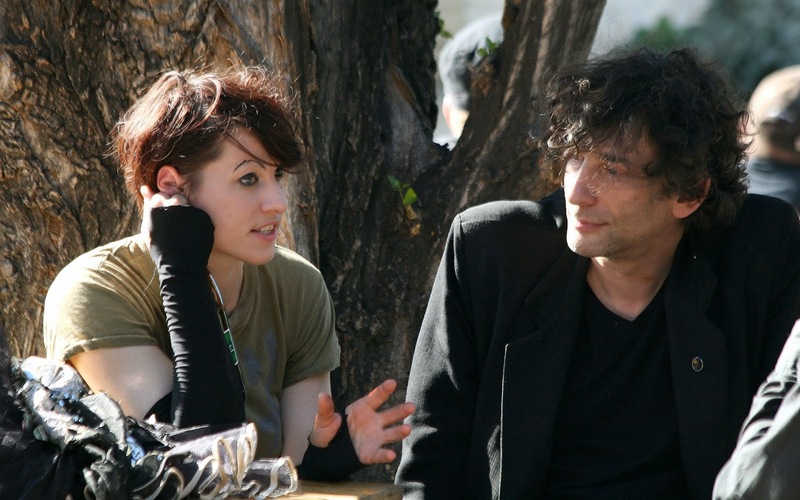 Amanda Palmer is an archetypal artistic personality: big and bold. And yet she fails to be a cliché. I find her music to be creative and vivacious. She is known for getting the audience involved in her performances and riling up a room, as a good rocker should. And, of course, they did a tour together. I've watched a few recordings of the performances and they are awesome. While we see both people displaying their creative strengths, with Amanda singing and Neil reading short stories, we also see them foraying out into each other's worlds, like when Neil sings a song he wrote for which Amanda composed the music. One of my favourite parts of the performance was the two stars responding to written questions from the audience. One questioner reported that he was a very shy, introverted person as Neil seemed to be; and yet Neil also seemed to have the ability to come out of his shell and be charming with people. What advice could Neil give to help others follow suit? 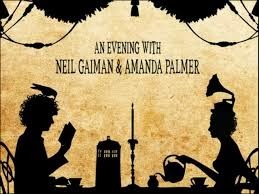 Neil chuckled and replied that his advice was simple, “marry Amanda Palmer”. He was joking but he did agree that getting together with someone who is not so shy is a good way to learn to be a bit more expressive of one's self. It was at this moment that I experienced a twinge of envy. I suspect many vowed religious experience this little pang when they meet a happy couple. A good marriage is a wonderful thing: it helps each of the pair to grow and to discover new perspectives about the world. I thought about the people who had been “Amanda Palmers” for me in my own life. But what might I be doing if I was pulled out of my shell a bit more? After a few days of reflection, it struck me: in a lot of ways, the Jesuits are my Amanda Palmer. I fell in love with this spiritual vocation and it opened my eyes to a larger world, taking me out of myself. I ended up doing things I'd never thought I'd do. The surprising and heartfelt stories of Montreal's homeless are as remarkable and poignant as any fantastical tale I've heard. And the bright and brilliant rhythms of Jamaica got me dancing. I've met so many interesting, unique, and good people who have helped me to see the world in different ways. The vocations of marriage and religious life are different and unique but both of them should help us grow and develop as people. They should make us more loving and kind to all as we come to know that we are loved by God in both the grand adventures and the little daily details. God draws us into dynamic relationship. He calls us to imagination, boldness, and brightness, no matter what our natural talents and gifts are. And that rocks.